March update number 2, on the very last day of the month. I'm cutting it a bit close but since I was travelling for the last few weeks that's pretty much how it has to be. This also marks the end of the Q1 roadmap I laid out a while back. Next week I'll take stock in regards to the things I achieved and especially those that I did not, probably with an article, maybe with an additional developer video. And I'll follow that up with another roadmap for the upcoming quarter. 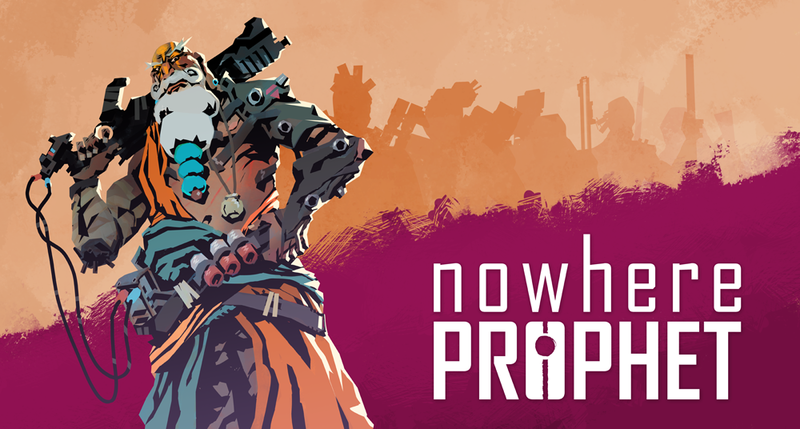 I'm also planning to write up an article on the first 6 months of the Nowhere Prophet First Access shortly after that. So lot's of writing, but since I'm back in the office there's enough time to put into the game. Nowhere Prophet has a few unlockable convoys and leader classes (and there will be more to come). However so far these were hidden unless you had managed to find them. 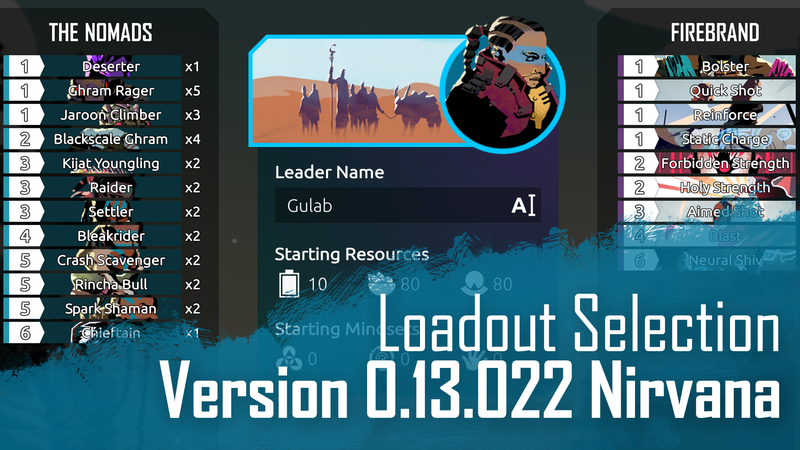 The menu about those has been completely redone so now you have a better overview over your current setup, it's quicker to change and you can find out about the classes and convoys you have not yet unlocked, with some hints on how to do just that. This will probably see some minor changes in the next few updates. This is actually a pretty small change but it feels sorta big because I'm so used to the old visuals, and I'm sure a few of you are too. The leader cards have become purple (previously red) and to mark cards you can't currently pay for the cost-hex now turns dark-blue instead of red. After having some chances to test the game during my travels I noticed that people always confuse the red color for enemy items, which is pretty obvious in hindsight. After all, the game consistently codes enemy units and stuff as red. This was a small change I tested on the road and I'm pretty confident that it will help new players get into the game quicker. In the past it was impossible to recruit beasts of drones directly via recruitment places. 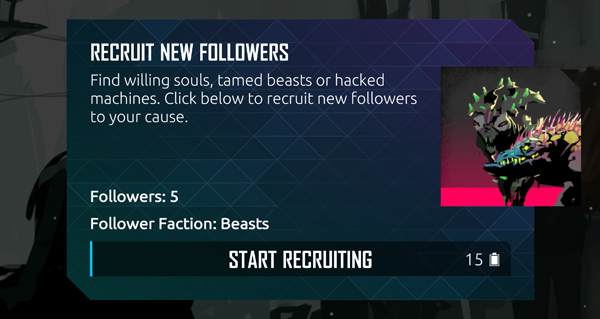 I've changed this so now if you travel to a beast region and hit a recruitment spot: You can recruit beasts. After all beasts can be tamed and machines can be hacked, so there's nothing wrong with that, right? To make that clearer I've also updated the description of the screen there. Thanks to Anjin and Jack we have a few new faces to grace the followers in the game. That allowed me to take out a few more of the duplicate faces. The game is shaping up to look better and better. In some rare cases effects would not proc. When multiple game-elements would react to the same event it was possible that thing were either triggered in error, or not at all. Thanks to some detailed reports I managed to reproduce this issue and find a deeper problem in the code that would show up in weird places all over the game. That should now be properly fixed. 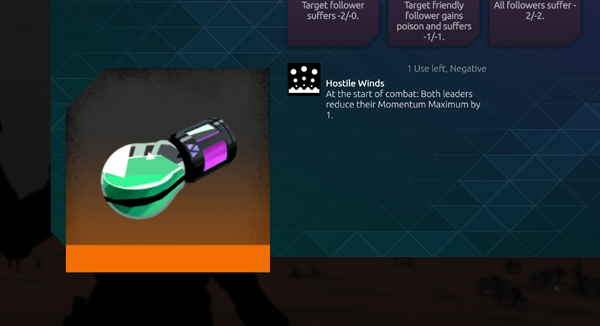 This also means that "At the start of your turn" now triggers at the start of the conflict too, and the change also allows for "at the start of combat" buffs, one such can be found on the SynGas bomb. bugfix: Renamed hunting rifle buff to "desperate glee"